2018 Hwacheon Ice Festival will be held soon! Most of Koreans like fishing. But now in the north part of South Korea every rivers and streams are frozen, there are only one way to fish, ice fishing. It’s really interesting, and I am telling you this because I’ve tried it and it’s one of the not expensive way to spend your time in Korea. 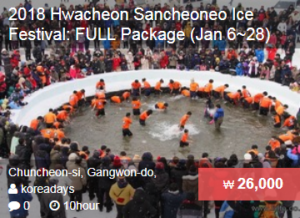 Hwacheon is located in Gangwon-do in north part of Korea, and there is a big Ice Festival. The main thing to do, as I said earlier is ice fishing, you just make an hole in the frozen river and you’re trying to catch some fish. It not that easy as you can see, because you’re not only one trying to catch. Also you’ll try to catch a Masou Salmon, which is known for its taste. And this fishes are known to live only in high quality fresh waters. Visitors fishing in the stream can be seen patiently waiting, and then jumping with excitement as they pull their catches from the hole in the ice. 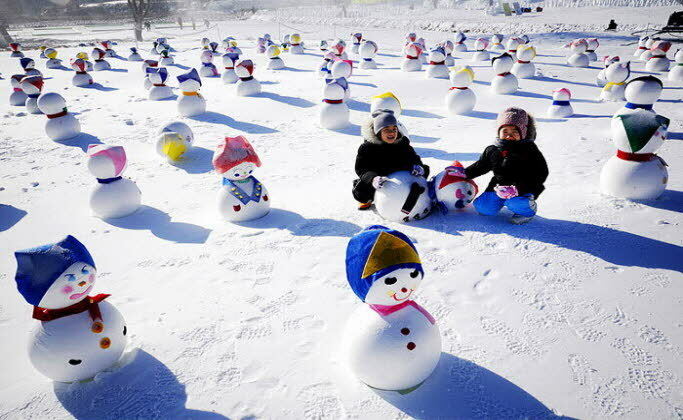 It’s a good chance to enjoy your winter in Korea and next I’ll tell you more about activities there. 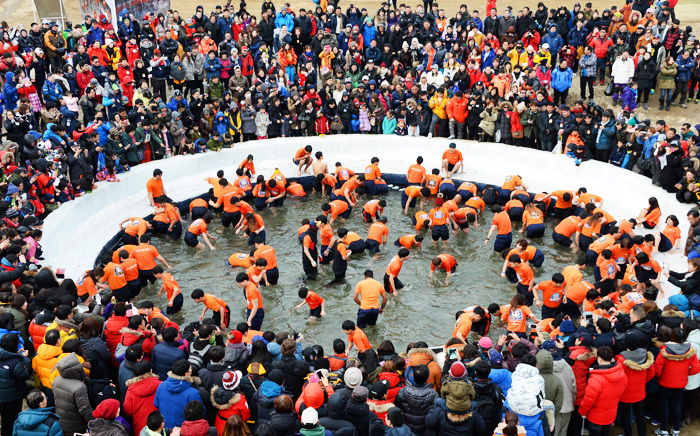 Sancheoneo fishing is the main activity at the Hwacheon Sancheoneo Ice Festival. There are three ways for visitors to fish at the festival: ice fishing on the frozen stream, lure fishing in the flowing waters, and bare-hand fishing in a pool. In addition, visitors can take the fish they have caught to be served fried or in raw slices for a fee in the food centers. Usually fees are about 3.000 won, but it’s totally worth it. ※ On-site tickets are available during the festival. Please be aware that tickets often sell out early in the morning on weekends. ※ Be sure to bring your passport to the ticketing booth to get the discounted fare! ☞ What to bring: Fishing pole/reel, metal lure, small chair, blanket, etc. ※ Items are also available for purchase on-site. For those who do not fancy the motionless wait while ice fishing, you may want to challenge yourself with some barehanded ice fishing. But I have to say that it’s really hard. It not that cold as you can think because you’ll be always in movements but it’ll take a lot of energy. Participants for the barehanded ice fishing change will be given festival tee-shirts and shorts to change into. After perform a simple warm-up exercise, participants jump into the pool at the word “Go!” and try to catch sancheoneo using their bare hands. Each participant is allowed to catch up to three fish. After the event is over, participants may thaw out their feet with a warm foot bath. 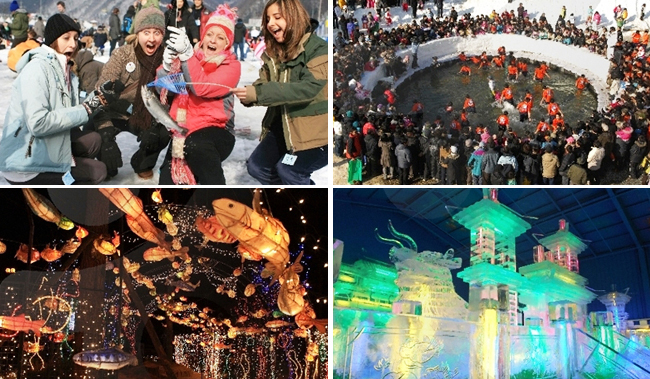 Snow and ice activities are other core part of Hwacheon Sancheoneo Ice Festival. The ice sledding experience zone features traditional Korean sleds and sleds from around the world. A 40 meter-long snow slope and 100m ice slope are also available to send thrills down your spine through various winter leisure sports including snow sledding, bobsleighing with a special tube and ice soccer. The excitement of Hwacheon Sancheoneo Festival can also be felt throughout the town of Hwacheon. Participants may find sancheoneo-shaped lanterns made from hanji paper and beautiful luminaries of LED lights brilliantly decorating Seondeung Street. Furthermore, large-scale ice sculptures lit up in an assortment of colors are on display at the ice plaza. There are also other festivities to enjoy including traditional Korean folk games and a photo zone. Here you can check some useful information, if you’re planning to go there! ☞ Directions: Dong Seoul Bus Terminal → Hwacheon Bus Terminal → Walk approx. 2min. to Temporary Intercity Bus Terminal Bus Stop → Take Bus No. 7 to Front of Base Bus Stop and walk approx. 10min to festival grounds. You can enjoy ice fishing with bnbhero tour! This entry was posted in Explore REAL Korea, Festivals & Events, Russian, Spot and tagged festival, festivals in Korea, fish, ice, ice fishing, winter.